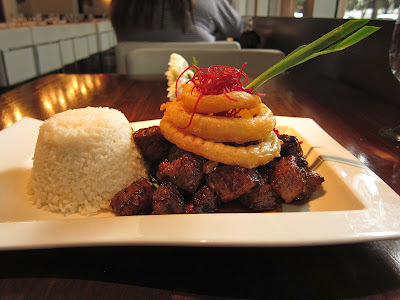 I strolled into the new Osha restaurant on 3rd St., which they took over after Bong Su went under. This restaurant has a completely different ambiance from the one on 2nd Street. Unlike the older, larger and more popular 2nd Street restaurant, this one has a different menu and a quieter dinner experience. They have wisely decided not to modify the tastefully decorated interiors from its previous avatar. 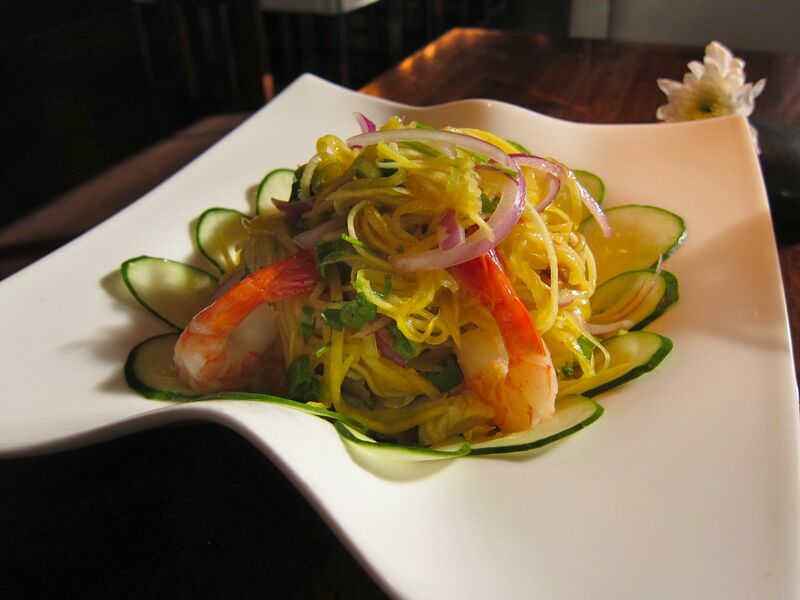 The Mango Salad was refreshingly nice with shredded green mango, warm shrimps, onion, lettuce, cucumber, and lemon juice. It was tangy and spicy in the way I like Thai salads. The Volcanic Beef with rice made for a pretty picture. 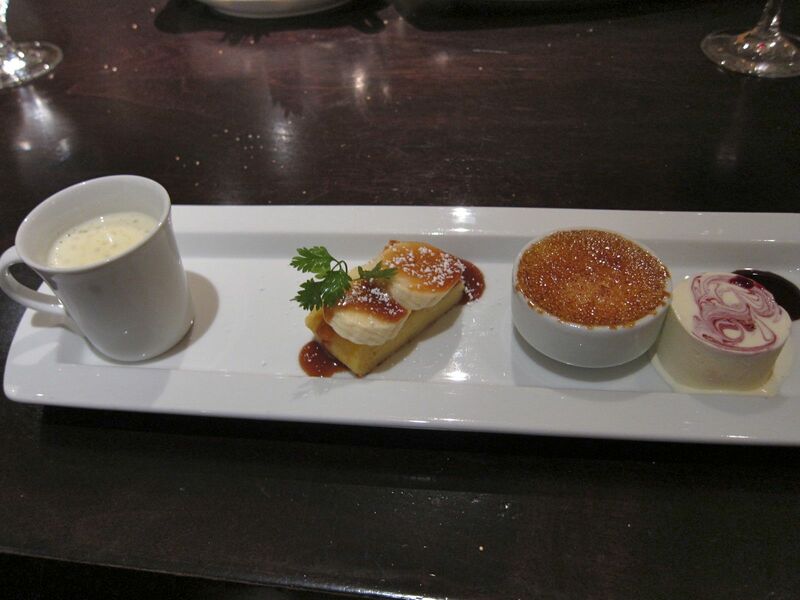 The dish was garnished with a trio of onion rings on top and tasted as good as it looked. 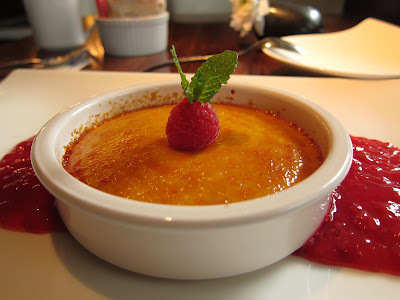 I ended this lunch with a ginger flavored vanilla creme brûlée topped with a raspberry. 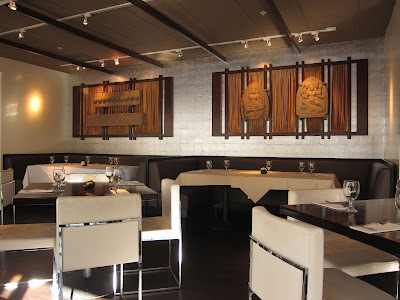 I still miss Bong Su which combined style and great food unlike any Asian restaurant I have seen before. However, Osha does a good job and this is a good place for a quiet Thai dinner in stylish surroundings. On another day, I was back at Parcel 104 with a group of colleagues. When you tell people you are going to a restaurant located within a Marriott hotel, they shake their heads sadly. Little do they know! Parcel 104 is an unusual gem and this visit was even better than my previous one. One of Bradley Ogden's outposts in California, this restaurant boasts of a new menu every day. This restaurant in the heart of Silicon Valley was as busy as ever. 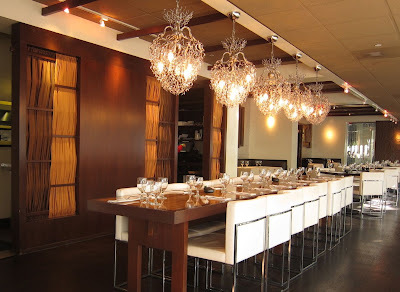 After a couple of martinis at the bar next door, we walked into the large, expansive dining room. 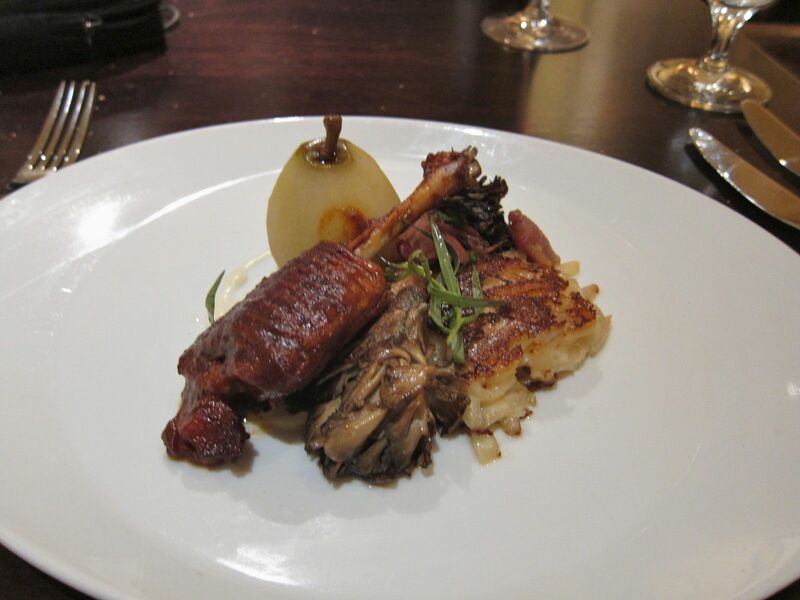 I began with the Confit of Sonoma Duck made with cheesy hash brown, sake poached pear and what the menu promised was a whole roasted wild hen of the woods. I knew tonight was going to be good at the first bite into the fat infused duck-meat! I am salivating even as I write this now. Hope this shows up on their menu the next time too. 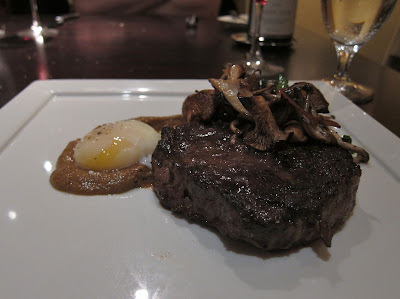 My entree was an oak-grilled Creekstone Farms Ribeye Steak with a soft-poached egg, smoked mushrooms and golden chanterelle 'cream'. Another winner that really tickled the tastebuds. I had asked for medium-rare, and the steak was cooked absolutely right. The sweet ending was fitting too: a Citrus brioche, bananas & caramel and Tahitian vanilla frozen cream! Doesn't get much better than this. I had an opportunity to eat at the much regarded - and Michelin starred - restaurant at Saratoga, The Plumed Horse. Unfortunately, that dinner didn't turn out to be as memorable as this one. I liked your posts. 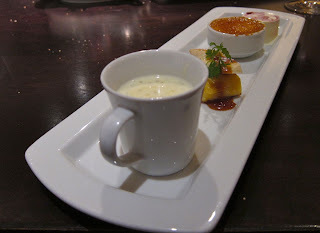 I am too an avid food and travel lover and I can relate to your posts. In any festival time owners keep clean and clear their hotels and resorts. Your snaps are really good I see here your dinning table also and food is fentastic.